Oxford Circus to Regent’s Park (4.35mi). And look out for the bright orange Home Run t-shirts. There are a number of factors why it is popular but it is the bag carrying service that is number one. 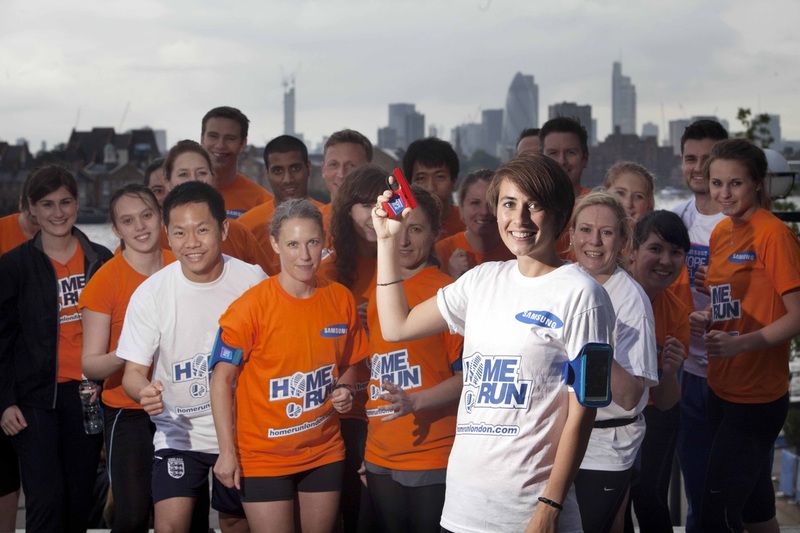 Top British middle distance runner Emily Pidgeon lends a hand at Home Run. The commute run is the ultimate example of killing two birds with one stone. But it doesn’t come without its list of hurdles. Luckily some creative minds have got together to form Home Run London, making running commuting a breeze. We caught up with Home Run mastermind Diccon Loy to get the low down. So what exactly is Home Run? It’s guided group runs home. We don’t go in and we don’t run around in circles. It’s a running group that takes people from work to home. The best bits are that we carry everyone’s bags and it’s free. In 2011 we started running one route on a pilot basis and that soon grew to four. [There are, as of March 2013, 15 routes that run several times a week]. There has been fantastic growth. Why should people run home when there are perfectly good (if slightly smelly, overcrowded, untimely, and time-sapping) public transport options? As Londoners we all experience the Tube and the trains as just a nightmare part of life in London. It’s a fantastic place but we all have to put up with transport. We noticed a lot of people cycling to work and also running in. Our observations were that these people were mainly guys, mainly with a rucksack on their back, and mainly look very fit. So we thought this is actually a viable form of commuting for a lot of people. At the weekend people might go to the park and run around. By the time you’ve run to the park, around it and back home, you might have run a similar distance to your commute. Yet people may not have ever considered running home. Even if you live 15 miles from where you work you can at least take the train in for some of the journey and run the rest. So we thought how can we make this more accessible? How can we make it more doable for the everyday Joe, not just the marathon runner or budding triathlete who will do it anyway? What hurdles do you see that prevent people from running as part of their commute? Firstly, they may not know the route. This is something we see when dealing with visitors. They’ll often get the Tube from Covent Garden to Leicester Square, when it’s actually fewer steps to walk it on street level than it is to go down to the Tube and come back up again. London’s a condensed city. So first of all there’s an education that you can actually run home. Then it’s safety. People might think, “Oh, I don’t like that area” or “I don’t want to run on my own at night”. So that is an element. But the key factor that we found in our research is that they’ve got stuff. [For running from work] you have to plan a few days ahead. It’s so difficult, you still need your diary on you and your phone and wallet—you can’t run with those things. As soon as we started the pilot we found everyone saying that the bag carrying service is the genius of it. There are a number of factors why it is popular but it is the bag carrying service that is number one. So can anyone become a “Home Runner”? Yes. Number one, if you are unsure about doing it, check out our Facebook page or our Twitter account. There are countless examples of participants just posting stuff about how much they’ve enjoyed it or how they were nervous the first time but when they got there they were put at ease by the run leaders and found that it was all achievable. The other thing is that it is absolutely not competitive. It’s is not a race home. We don’t time anyone. You don’t come first or second or last. In fact the run leader is last so we make sure we’re right at the back of the group. And can people volunteer to help out? We’ve got a few that volunteer. There’s a section on the website where we recruit cyclists, drivers who take the bags and lead runners. So the bags are actually carried by specially designed cargo bikes but when the runs get up to a certain size—some of our runs are already at 40 or 50 per run—then the poor cyclist can’t cope with that sort of load. It’s then when we switch to cars and vans. We pay the volunteers because we need to ensure that things are 100 per cent watertight so we don’t ever let any of our customers down. It may evolve into more volunteering but at this initial stage we made the decision to pay people for doing this for a couple of hours. We’ve actually recruited a lot of former participants. When we’ve said that we’re actually looking for someone to lead this group, they’ve jumped at the chance. So who are the generous people behind this cool idea? I work for a company called Limelight Sports and this is exactly what we do. We create, promote, deliver, and manage programmes and events that get people into sport and connect with charities, with national governing bodies and with brands. As a business we only deal with participation sport. Getting the everyday public into grassroots sport and sustaining them in it. I’ve got a team of people working on it delivering it, so it’s by no means a solo effort. It’s taken a lot of work and creativity from a lot of people in the team. And it’s very rewarding. And how do you keep it free for participants? The overall business model is commercial partnerships [during the Olympics Samsung were a key sponsor and had various charity fundraising initiatives through Home Run] and public money as well. So it’s a combination of both. We might need to charge at some stage in the future but we are very keen to keep it free. Is this happening anywhere else in the world? It’s a totally unique service around the world. We’ve already been approached by a number of cities in the UK and abroad who are keen to replicate it. We’d absolutely love it if we could see Home Run in cities across the UK and the world. To find out more about how you can “Get Fit and Get Home”, as the Home Run slogan goes, check out their website.